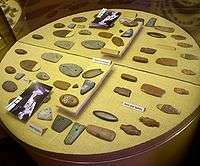 Poverty Point culture is an archaeological culture that corresponds to an ancient group of Indigenous peoples who inhabited the area of the lower Mississippi Valley and surrounding Gulf coast from about 2200 BC - 700 BC. Archeologists have identified more than 100 sites as belonging to this mound builder culture, which also formed a large trading network throughout the eastern part of what is now the United States. Dating of the Watson Brake site in present-day Ouachita Parish, Louisiana, where eleven earthwork mounds were built beginning about 3500 BC, shows it to be the earliest, dated mound complex in the Americas. It was begun well before the construction of the pyramids in Egypt. Next oldest is the Poverty Point Culture, which thrived from 2200 BC- 700 BC, during the late Archaic period in the Americas. Evidence of this mound builder culture has been found at more than 100 sites, including the Jaketown Site near Belzoni, Mississippi. The largest and best-known site is at Poverty Point, which lies on the Macon Ridge near present-day Epps, Louisiana. The Poverty Point culture may have hit its peak around 1500 BC. It is one of the oldest complex cultures, and possibly the first tribal culture in the Mississippi Delta and in the present-day United States. The people occupied villages that extended for nearly 100 miles (160 km) on either side of the Mississippi River. 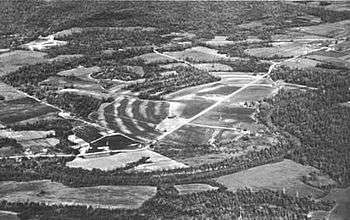 Although the earthworks at Poverty Point are not the oldest in the United States, (the earthworks at Watson Brake were built about 1900 years earlier) they are notable as the oldest earthworks of this size in the Western Hemisphere. In the center of the site is a plaza, a constructed and leveled, flat, open area covering about 15 hectares or 37 acres (150,000 m2). Archeologists believe the plaza was the site of public ceremonies, rituals, dances, games and other major community activities. The site has six concentric earthworks separated by ditches, or swales, where dirt was removed to build the ridges. The ends of the outermost ridge are 1,204 metres (3,950 ft) apart, which is nearly 3/4 of a mile. The ends of the interior embankment are 594 metres (1,949 ft) apart. If the ridges were straightened and laid end to end, they would compose an embankment of 12 kilometres (7.5 mi) long. Originally, the ridges stood 4 feet (1.2 m) to 6 feet (1.8 m) high and 140 feet (43 m) to 200 feet (61 m) apart. Many years of plowing have reduced some to only 1 foot (0.30 m) in height. Archeologists believe that the homes of 500 to 1,000 inhabitants were located on these ridges. This was the largest settlement at that time in North America. The site also had a 50 feet (15 m) high, 500 feet (150 m) long earthen pyramid, which was aligned east to west. A large bird effigy mound, measuring 70 feet (21 m) high and 640 feet (200 m) across, is also located on the Poverty Point site. On the western side of the plaza, archeologists have found some unusually deep pits. One explanation is these holes once held huge wooden posts, which served as calendar markers. Using the sun’s shadows, the inhabitants could have predicted the changing of the seasons. This great building project demanded a sustained investment of human labor, the organized skill and the cultural will to sustain the effort over many centuries. One authority calculated that it would take more than 1,236,007 cubic feet (34,999.8 m3) of basket-loaded soil to complete the earthworks. That would mean 1,350 adults laboring 70 days a year for three years. Archeological excavation has revealed a wealth of artifacts, including animal effigy figures; hand-molded, baked-clay cooking objects; simple thick-walled pottery; stone vessels, spear points, adzes, hoes, drills, edge-retouched flakes, and blades. Stone cooking balls were used to prepare meals. Scholars believe dozens of the cooking balls were heated in a bonfire and dropped in pits along with food. Different-shaped balls controlled cooking temperatures and cooking time. 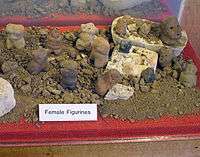 Another type of artifact, crude human figures, are thought to have been used for magical purposes. Points made of imported gray Midwestern flint were also found. In addition, plummets were fashioned out of heavy iron ore imported from Hot Springs, Arkansas; they served as weights for fish nets. Many of the raw materials used, such as slate, copper, galena, jasper, quartz, and soapstone, were from as far as 620 miles (1,000 km) away, attesting to the distant reach of the trading culture. The Poverty Point culture developed a tradition of making high-quality, stylized, carved and polished miniature stone beads. Other early cultures in eastern North America rarely used stone to make their beads, opting for softer materials such as shell or bone. The fine cutting, engraving and polishing lapidary work done by these people resulted in refined and unique art forms. They made the beads in the images of many different animals that were common to their environment, such as an owl, dog, locust, and turkey vulture. ↑ Fagan, Brian M. (2005). Ancient North America : The Archaeology of a Continent (4 ed.). New York: Thames & Hudson Inc. p. 390. ↑ Townsend, Richard F. (2004). Hero, Hawk and Open Hand : American Indian Art of the Ancient Midwest and South. London: Yale University Press. p. 17. ↑ Berlo, Janet C.; Phillips, Ruth B. (1998). Native North American Art. Oxford University Press. pp. 75–76. 1 2 Fagan, Brian M. (2005). Ancient North America : The Archaeology of a Continent (4 ed.). New York: Thames & Hudson Inc. p. 418. ↑ "Poverty Point: The First Complex Delta Culture". Retrieved 2011-11-10. ↑ "Lapidary Beads". Lithiccasting Lab.